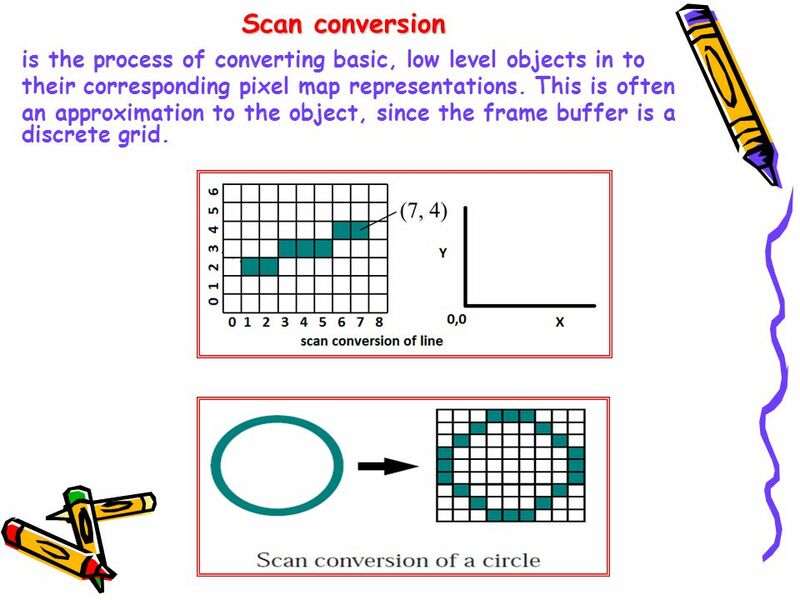 2 Scan conversion is the process of converting basic, low level objects in to their corresponding pixel map representations. This is often an approximation to the object, since the frame buffer is a discrete grid. 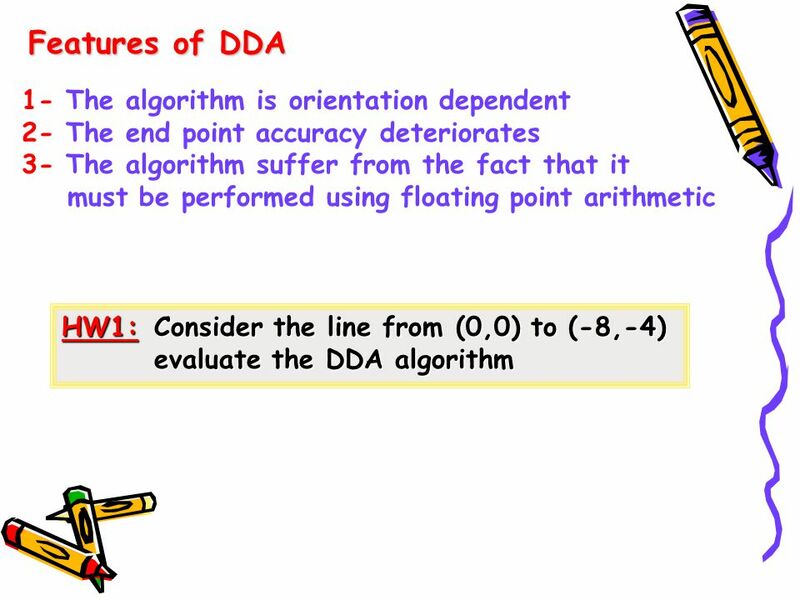 Direct or floating or simple algorithm Digital Differential Analyzer algorithm (DDA) Bresenham's algorithm or midpoint algorithm General Bresenham's algorithm Description: Given the specification for a straight line (parameters). 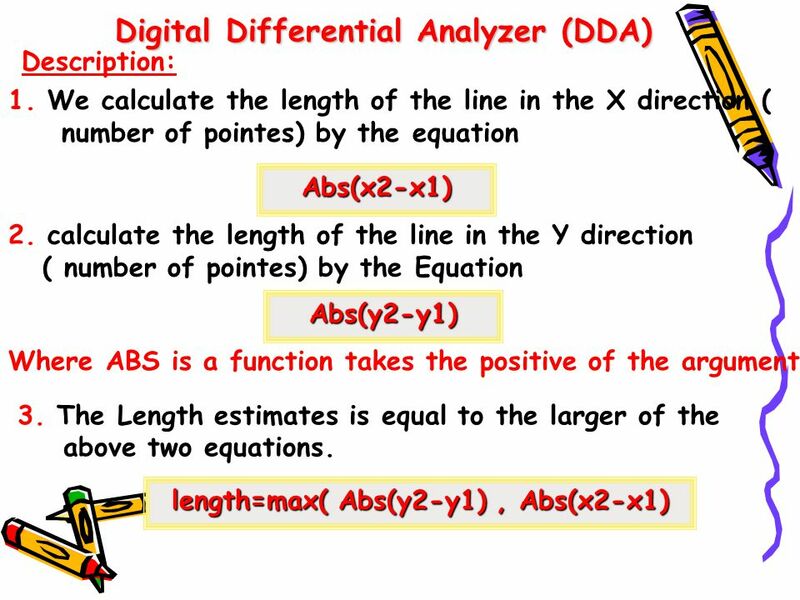 find the collection of addressable pixels which most closely approximates this line (mathematical equations) . 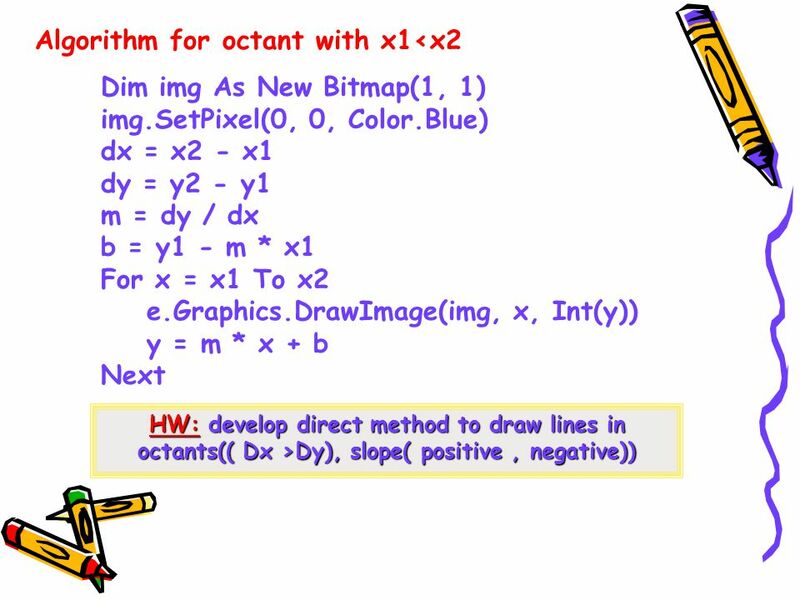 Draw the scan conversion of lines (frame buffer map). Goals Straight lines should appear straight. Lines should start and end accurately. Lines should be drawn as rapidly as possible. 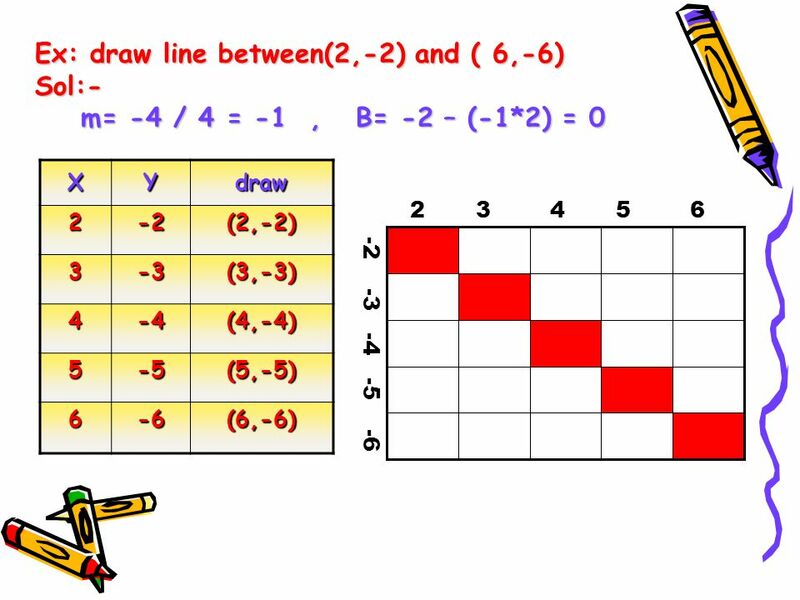 matching endpoints with connecting lines. Lines should have constant brightness. 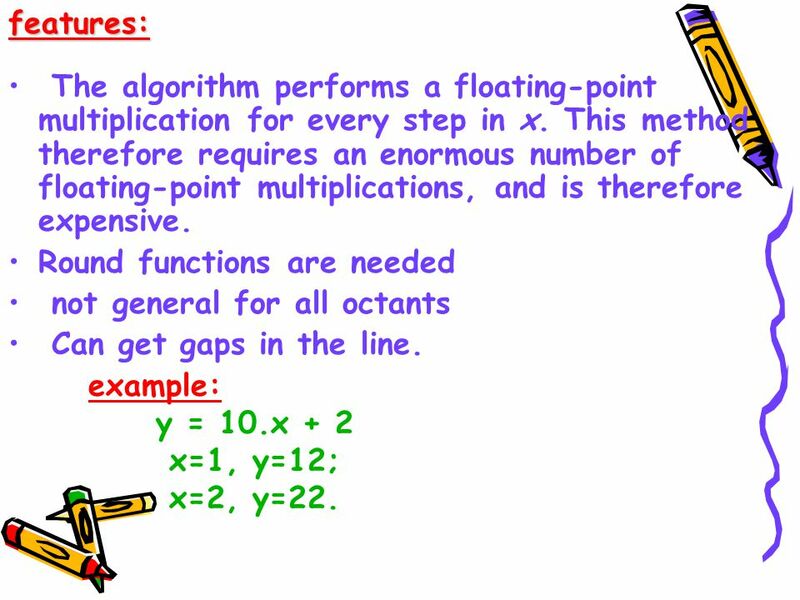 8 features: The algorithm performs a floating-point multiplication for every step in x. 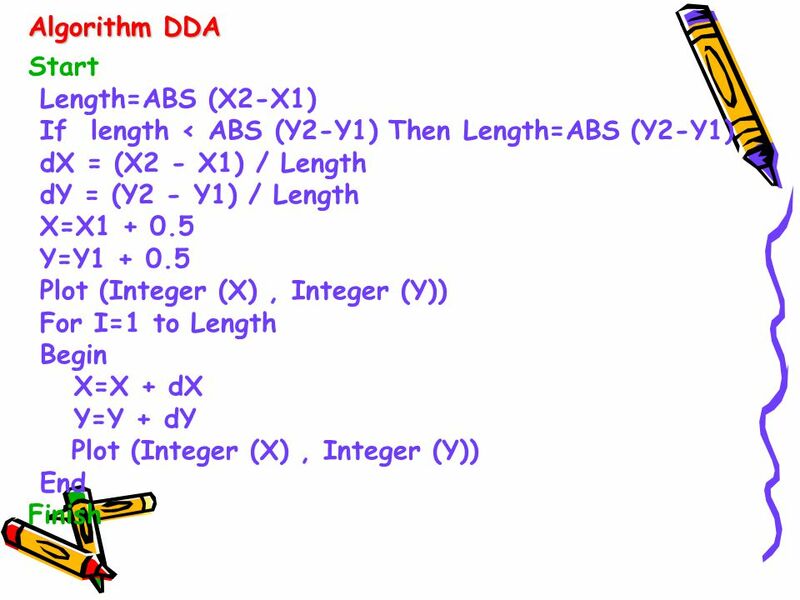 This method therefore requires an enormous number of floating-point multiplications, and is therefore expensive. 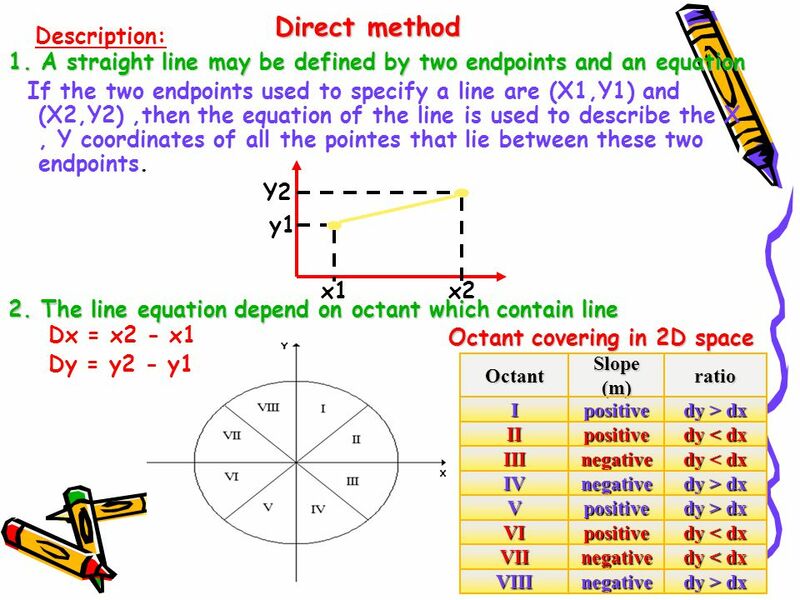 Round functions are needed not general for all octants Can get gaps in the line. 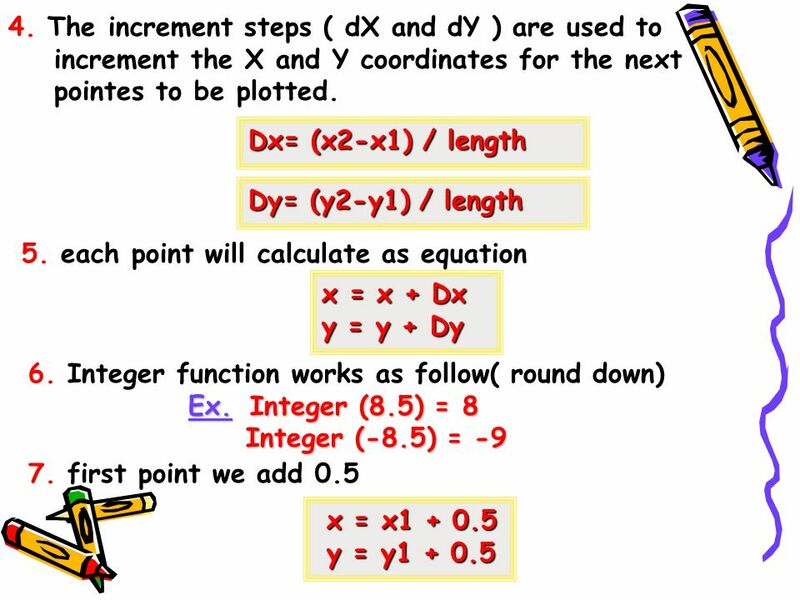 example: y = 10.x + 2 x=1, y=12; x=2, y=22. 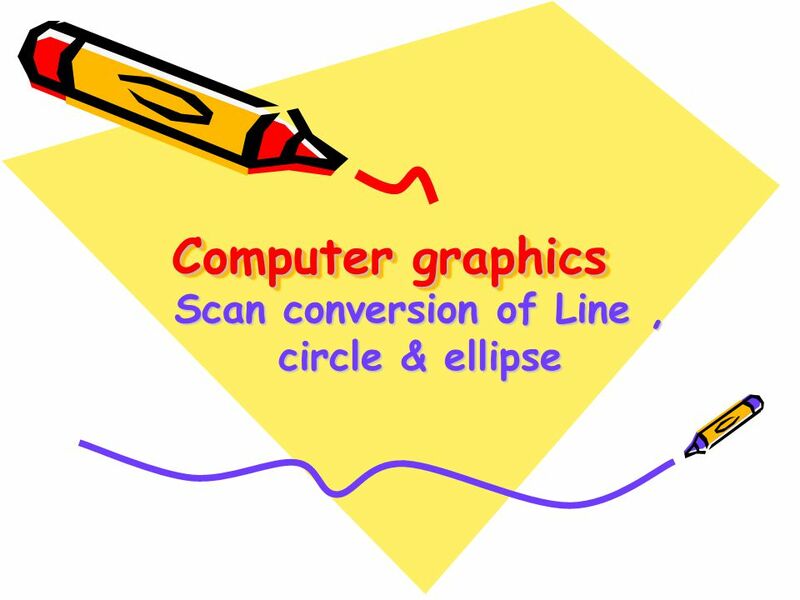 Download ppt "Scan conversion of Line , circle & ellipse"
Graphics Primitives Part II: Bresenhams line and circle. 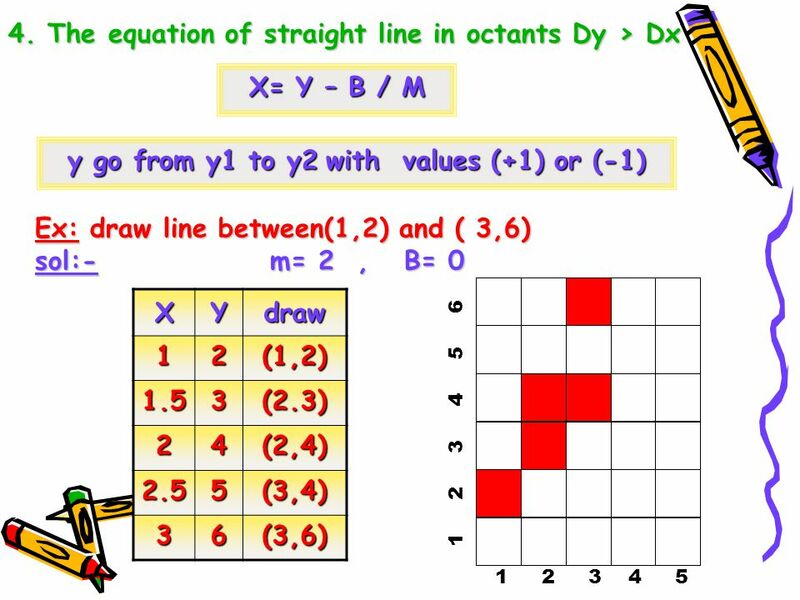 5.1 Si23_03 SI23 Introduction to Computer Graphics Lecture 5 – Drawing A Line. 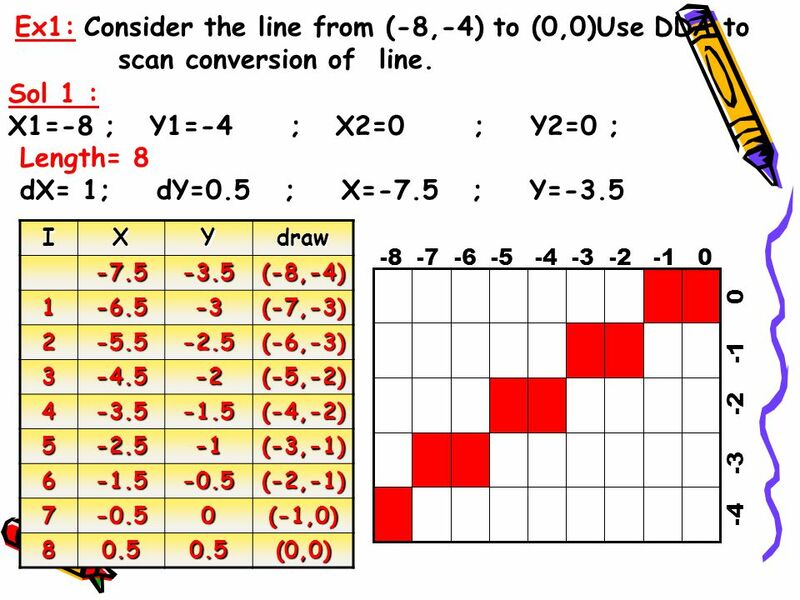 CS 4731: Computer Graphics Lecture 20: Raster Graphics Part 1 Emmanuel Agu. 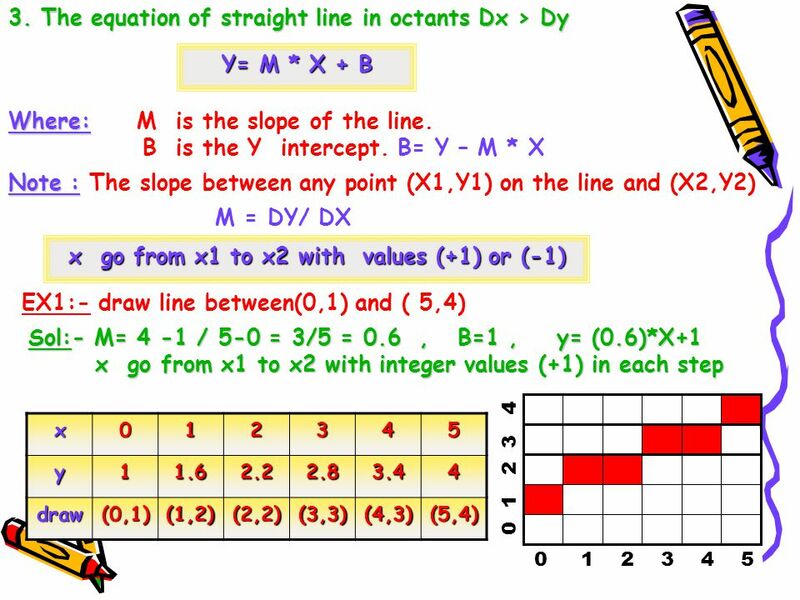 Section 3-1 to 3-2, 3-5 Drawing Lines Some of the material in these slides may have been adapted from university of Virginia, MIT, and Åbo Akademi University. CS 376 Introduction to Computer Graphics 02 / 02 / 2007 Instructor: Michael Eckmann. 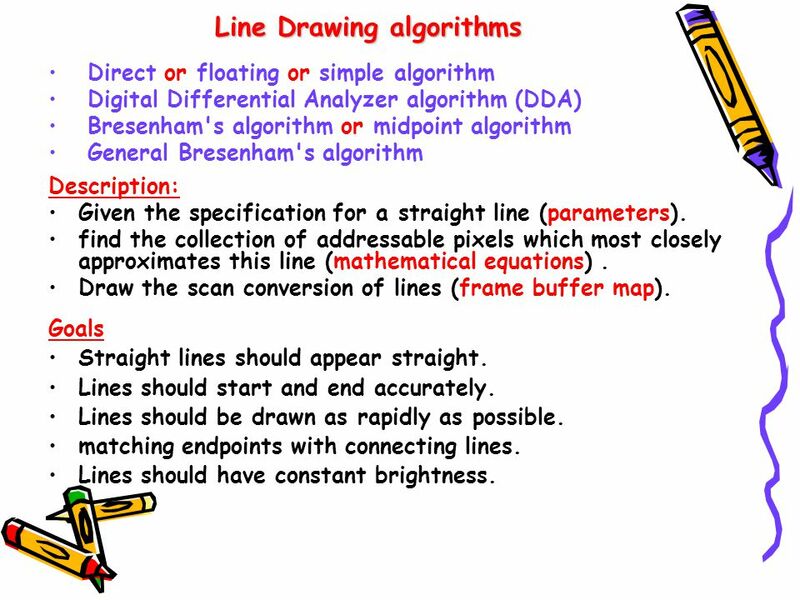 Computer Graphics 4: Bresenham Line Drawing Algorithm, Circle Drawing & Polygon Filling By:Kanwarjeet Singh. 1 King ABDUL AZIZ University Faculty Of Computing and Information Technology CS 454 Computer graphics Drawing Elementary Figures Dr. Eng. Farag Elnagahy. CS 450: COMPUTER GRAPHICS REVIEW: DRAWING LINES AND CIRCLES SPRING 2015 DR. MICHAEL J. REALE. + CPCS 391 Computer Graphics 1 Instructor: Dr. Sahar Shabanah Lecture 3. Lecture 5 Rendering lines 1.Steps of line rendering 2.Scan-conversion for line segments 3.A1 tutorial CP411 Computer Graphics Fall 2007 Wilfrid Laurier. Line Drawing Algorithms. Rasterization-Process of determining which pixels give the best approximation to a desired line on the screen. Scan Conversion-Digitizing. Computer Graphics Lecture 3 Line & Circle Drawing. Larry F. Hodges (modified by Amos Johnson) 1 Design of Line, Circle & Ellipse Algorithms. 30/9/2008Lecture 21 Computer Graphics Assistant Professor Dr. Sana’a Wafa Al-Sayegh 2 nd Semester ITGD3107 University of Palestine. Advanced Manufacturing Laboratory Department of Industrial Engineering Sharif University of Technology Session # 6. Lecture 17 Fun with Graphics Dr. Dimitrios S. Nikolopoulos CSL/UIUC.